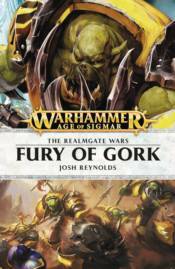 Zephacleas and his Astral Templars have been sent into the wildest regions of the Ghurlands to seek out Gorkamorka, the double-headed god of the orruks and one-time ally of Sigmar in the age before Chaos. However, their search is interrupted in the boneyards of the gargants by the Tzeentchian sorceress Sharizad, who quests for a powerful daemonsword. Aided by the black-clad Sons of Mallus, the Astral Templars must brave the Howling Labyrinth to stop the weapon from falling into the wrong hands, and unexpected allies in this mission might lead them close to their original goal: meeting the fist of Mork and the fist of Gork.